JMV is offering a JC4(MC4) PV Connector to make the wiring easier and establishing fewer connections. This Connector is providing a type of connection for solar panels which consists of a female and a male connector. This female and male connector is in conjunction to a plug and socket design. When these two are pushed together, they form an interlocking connection between themselves. The connection will not disconnect when the cables are pulled out unintentionally. 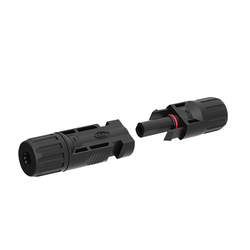 Looking for MC4 Connector ?